When I first moved in with my Main Taste Tester I promised him I’d make him granola bars every week. Um, let’s just say my follow through has been less than stellar on that vow. Sure, I make him lots of wonderful things to eat. True, he never goes hungry. But granola bars are one of the things he regularly requests, always gobbles up and whines if he doesn’t have them on hand. Recently I saw this recipe and was instantly feeling guilty about my track record as of late. When I saw how healthy they were (much healthier than his original favorite) I decided to give it a try, with several tweaks. They literally took minutes to get into the oven and with no added sugar, butter or oil, are incredibly healthy. They aren’t super sweet which my MTT loves but if you want them sweeter, try adding a bit of brown sugar or honey. 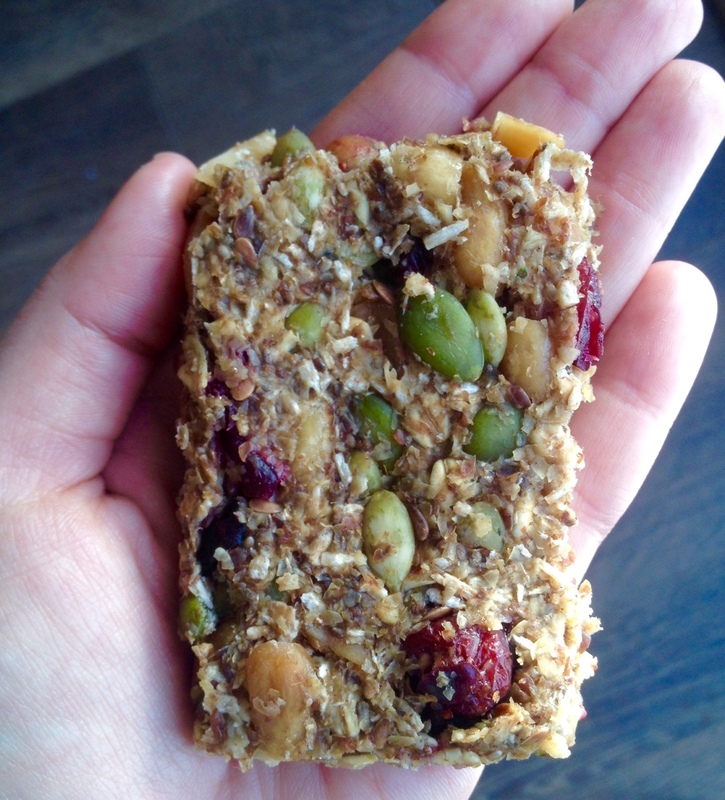 These are a cakey bar, rather than chewy or crunchy and they are already a new breakfast favorite in our house. They also make a great snack when you need some staying power to get you through and go great with an afternoon cup of tea. Just look at all the good stuff in them! Preheat oven to 350 degrees. Line a 9×13 baking dish with parchment or silpat and set aside. In a large bowl, stir together the mashed banana and vanilla. Then add everything else and stir until the mixture is thick and well mixed. Pour the mixture into the prepared baking dish and press down well with your hands to pack the mixture down. Smooth the top. Bake for 25 minutes or so until firm and starting to become lightly browned. Cool for at least 10 minutes, then remove from the pan onto a wire rack to finish cooling. Once cooled, cut into bars and store in an airtight container.